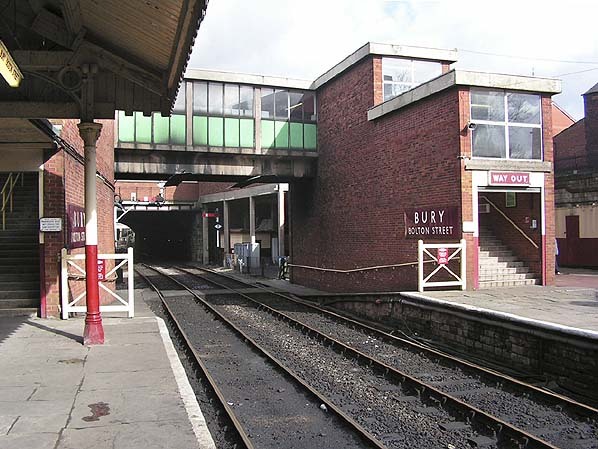 Looking north at the footbridge at Bury Bolton Street station which was opened on 30th June 1952. The footbridge replaced an 1880s structure which had been badly damed by fire on 14th May 1947. The footbridge connects into a corridor which links with the street level booking office the concrete support pillars for which can be seen to the right of the line. In this view from March 2008 the scene looks very 1960s, the station having been restored to reflect that era by the 'new' ELR.